WASHINGTON – FBI Director James Comey said Tuesday that even though he is convinced that the Islamic State of Iraq and Syria (ISIS) will be destroyed soon, that will not be the end of it. Comey, in testimony before Congress, said the U.S. remains extremely concerned that violent extremists will eventually flow out of Syria and Iraq and into other countries in hopes of committing attacks. The number of Americans traveling to Syria to fight alongside ISIS has slowed to a trickle in the last year, but as the so-called caliphate becomes “crushed,” many militants from Western nations who are already there will stream out of the region and create new security threats. 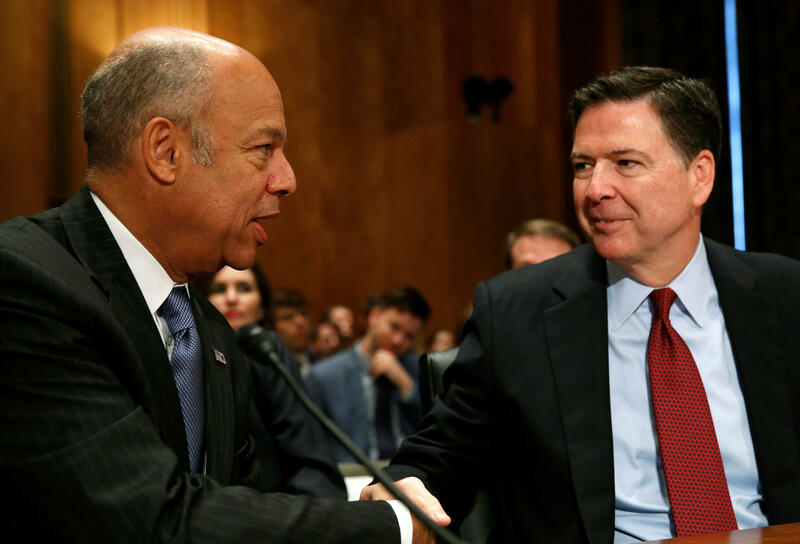 Comey was testifying alongside Homeland Security Secretary Jeh Johnson and Nicholas Rasmussen, director of the National Counterterrorism Center, at a hearing examining threats to national security 15 years after the9/11 attacks. The hearing took place just over a week after bombings in New York and New Jersey and a separate stabbing attack at a Minnesota mall​. Rasmussen said that in addition to ISIS militants, U.S. government officials are concerned about the capabilities and ambitions of al-Qaida and its affiliates. The panel’s chairman, Sen. Ron Johnson, R-Wis., said the threat of “militant Islamic terrorist attacks to the United States remains significant,” citing the Sept. 17 attacks in the New York region and Minnesota, as well as deadly attacks in San Bernardino​, California, and Orlando, Florida​. “In all, Islamic extremist terrorist have killed 63 people on U.S. soil since our committee last held its annual hearing to consider threats to the homeland,” the chairman said in a prepared statement. Two years after President Barack Obama stated a goal of defeating ISIS, “we have made little progress,” said the senator, who is not related to the Homeland Security chief. Republican senators pressed Comey on Tuesday about whether anything more could have been done to prevent recent acts of extremist violence, including the Orlando nightclub massacre and the Manhattan bombing this month. Comey said the FBI is fallible and transparent about its mistakes, but he did not concede that anything should have been done differently or that any red flags were missed. The questions arose because the FBI has said it investigated Orlando gunman Omar Mateen​ a few years before the June shooting and interviewed him multiple times. The FBI in 2014 also looked into Ahmad Khan Rahami​, the Afghan-born U.S. citizen accused in the explosion, but found nothing that tied him to terrorism. Two senators, in particular, Rand Paul of Kentucky and Kelly Ayotte, said they were alarmed that both individuals had at one point been on the FBI’s radar but were not intercepted. “What more do we need to do? What are the lessons learned, and if you need additional support, we need to know about it very quickly,” Ayotte said at a hearing of the Senate Homeland Security and Government Affairs Committee. Paul, one of the Senate’s leading civil liberties champions, said he was troubled that the FBI appeared to often seek new tools but didn’t seem to adequately use the ones they had. Comey pushed back against the criticism, telling Paul that he had his facts wrong in characterizing the FBI’s investigations into both Mateen and Rahami. He said he had commissioned a review into the FBI’s past interactions with Mateen, who killed 49 people inside a gay nightclub, and would be doing the same with Rahami. “We’re going to go back and look very carefully about the way we encountered him,” he said. The FBI opened an assessment on Rahami in 2014 following a domestic incident. His father has said he warned the FBI that his son was drawn to terrorism, though law enforcement officials say he never discussed his son’s apparent radicalization. Comey said Rahami’s actions do not point to a larger terror cell. Rahami, the main suspect in the New York bombing, faces federal terrorism charges after a shootout with police.